Smoked ham “Presunto” and Figs are probably one of the most recognizable eats in a Mediterranean diet, yet you rarely see them on the same dish. A Smoked Ham and Fig Salad is the perfect way to combine these sweet and savory ingredients in a delicious and light dish. This salad is very easy to make without any fuss and is quite a healthy and hearty eat for anytime of the day. 1) In a platter place the fresh mozzarella slices with the smoked ham on top. 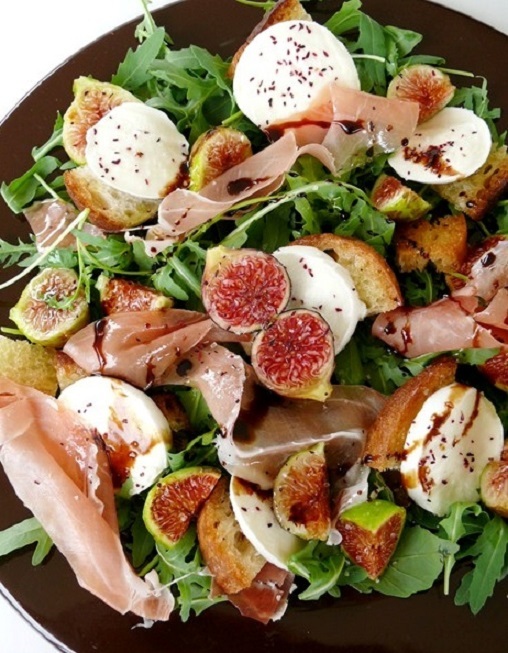 2) Place the fresh figs scattered on the plate, as well as the arugula and basil leaves. 3) Drizzle the olive oil, balsamic vinegar, and salt and pepper to taste over the plate.